Technologies used for identifying potential offenders, for predicting criminal offenses, for recidivism risk assessment, or for assessing the likelihood of delinquency are already widespread in the USA. In Germany, the use of predictive technologies in the context of law enforcement and criminal justice has so far been restricted to a specific variant of the space and time-related prediction of domestic burglary (see Egbert and Gerstner, this issue). However, due to the interdependent expansion of digital surveillance and control, as well as and the increasing data production in all areas of life, their application in other areas of policing and in the criminal justice system is likely imminent. It is important to emphasize that neither in the USA (see Perry et al. 2013) nor in Germany (see Gluba 2014), have independent studies been published that have demonstrated a strong effect of the use of these predictive technologies on crime rates. According to recent research (see Amoore 2011, 2013; McCulloch and Wilson 2015), the overwhelmingly positive reception of predictive security technologies by security actors results, on the one hand, from the mere fact that it allows the implementation of proactive security practices. On the other hand, the use of predictive security technologies promises a more efficient use of resources, which appears extremely attractive in view of scarce public funds, scarce staff, and a perception of ever-increasing demands. At the same time, these technologies raise a number of legal (see Martini 2014; Meinicke 2015; Singelnstein 2018) and social problems (see Harcourt 2005; Hunt et al. 2014; Ridgeway 2013; Wagner 2015; Ziewitz 2015) that need to be considered when assessing the impact on societies (Ostermeier 2018). This Special Issue is a contribution to the growing body of work that puts a focus on the emergence, development, and implementation of predictive security technologies. 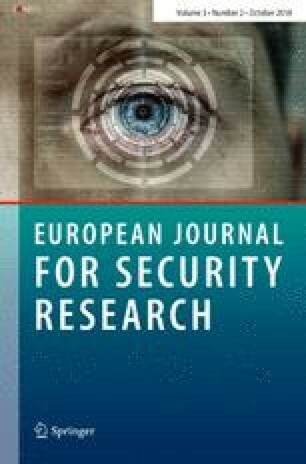 Policy makers, industry researchers, and officials in security agencies appear to be occupied with developing “techno-fixes” for the inherently societal problems that underlie a field that has been described as “societal security.” Studying the development and use of technologies has moved to the center stage of applied Security Research. In numerous research and development projects funded by government agencies, social scientists and engineers cooperate to develop technologies that are supposed to address needs that have been defined by funding agencies. Going along with, and in reaction to the growth of policy-driven research and development, security technologies have become a matter of interest for scholars from various disciplinary backgrounds, such as Surveillance Studies, Critical Security Studies, and Science and Technology Studies. In these academic contexts, the development and use of technologies for security purposes has inspired theoretical debates and empirical insights that often leave established paths for analytical inquiries by opening up new perspectives and approaches. From the perspective of Surveillance Studies, surveillance in modern societies primarily works through technology (Marx 2015). In this respect, the constitutive role of surveillance technologies in the (re)production of social order and social control must inevitably be taken into account. The starting point for the investigation of surveillance technologies was the examination of Foucault’s concept of the disciplinary society (1975). The development of modern surveillance technologies appeared to (re)enact the project of a disciplinary society. Empirical research on the impact of surveillance technologies on societies, however, gave a much more nuanced picture. One of the key findings of this research is that the impact of surveillance technologies is far from the total control of the individual targeted by Jeremy Bentham in the design of the panopticon but rather depends on the implementation of the technologies through the practices of security workers (Norris and Armstrong 1999). In the past few years, there has been a growing interest in the analysis of material objects and technologies in Critical Security Studies. This interest is sometimes understood as a continuation of the “practice turn” in international relations or as the basis of a “material turn” that covers the whole discipline (Amicelle et al. 2015: 293–294). Regardless of such disciplinary qualifications or attributes, the paradigmatic significance of this development lies in the fact that not only technologies as new objects of investigation became a matter of interest. Moreover, within debates about (in)security and securitization, new critical perspectives and analytical thrusts have opened up. By paying attention to security technologies, it becomes possible to look at securitization as a process that can only be achieved through a material infrastructure or material instruments and that can only be stabilized temporarily (ibid., 294). Furthermore, more and more scholars within Science and Technology Studies engage with the material infrastructures “that hold the logics of (in)security in place, as well as the practices through which those logics realize their effects” (Suchman et al. 2017: 984). As security has fundamentally changed in the twenty-first century, new opportunities for a closer engagement between STS, Critical Security Studies, and Surveillance Studies have emerged (M. and Rappert 2017: 973). Security technologies can thus be understood as “boundary objects” (Star and Griesemer 2016: 65) for these different disciplines. They are plastic enough to adapt to the different rules of these disciplines and can be interpreted differently across them, but have enough immutable content to maintain integrity. Therefore, “[t]he creation and management of boundary objects is key in developing and maintaining coherence across intersecting social worlds” (ibid., 393). This is just to sketch a few of the recent productive movements in the study of security technologies that have contributed to the development of multi-disciplinary approaches that focus primarily on thematic issues, rather than tapping the subject area through disciplinary approaches. This Special Issue documents some of the papers that have been prepared for an interdisciplinary workshop on predictive security technologies that have brought together scholars from Computer Science, Political Science, Law, Sociology, and Criminology.1 The contributions to this Special Issue present the perspectives and analyses of security technologies from these different disciplines. They address the emergence of devices and fields of application in the prediction of criminal offenses (predictive policing) (contributions by Egbert and Gerstner), the analysis of threats with passenger name records (contribution by Ulbricht), the analysis of social media for the prediction of terrorist attacks (contribution by Pelzer), and recidivism risk assessment (contribution by Zweig et al.). While the contributions in this volume address different technologies and their use for different purposes, they share a common concern about the clarity and precision of the terms and concepts that are used for empirical analysis. The uncertainty about adequate terms begins with the question of what exactly a technology is and ends with the ongoing controversy about the agency of these technologies. Another question that all contributions struggle to answer is the extent to which these technologies bring qualitative changes to the ways in which institutions and actors in law enforcement and criminal justice operate. In short, the relevance of the contributions lies not only in the attempt to address contemporary technological developments in law enforcement and criminal justice but also in putting a large number of questions forward that have yet to be addressed. Addressing these questions allows us to critically engage emerging technological trends, with the objective of contributing to the formulation of research agendas and policies that are being designed to implement and use predictive technologies and analytics in law enforcement and criminal justice. The workshop took place at Albert-Ludwigs-Universität Freiburg/Germany in March 2017. It received generous funding from the Fritz-Thyssen Foundation.